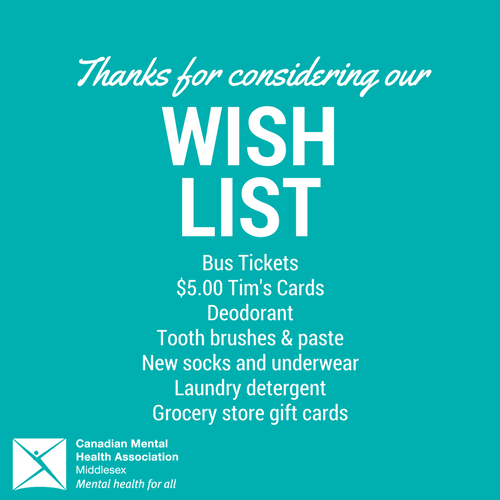 If you are interested in donating items to directly support individuals at CMHA Middlesex , please consider donating the following items. Please note that we are unable to accept donations of clothing or household items but encourage you to donate to the Mission Store who we have a great partnership with to provide clothing to individuals we support. Donations can be dropped off at any of our locations. My Sisters’ Place gratefully accepts in-kind donations of the following items. You can drop off donations during our open hours (Weekdays 10-3 pm, 5-8 pm and weekends 11-2 pm) at 566 Dundas St., London, Ontario.